In one’s own way and looking back, one can recognize some moments that have undoubtedly transformed and influenced positively in training, also in life. There are times when one has to learn abruptly to make you see beyond the own convictions. This is the purest process of learning within the Art, this is Eskrima. A few years ago I had the privilege of meet and training with one of the best Eskrimadores I have encountered, GM John Mac of Cacoy Doce Pares Eskrima. To say that he is capable of doing things in seemingly impossible in the short distance it´s to say just a little. Possibly he is one of the few people in the world who is able to put into practice (in sparring) the Art of Manong Cacoy. I have had the honor to interview him exclusively for Orihinal Eskrima. The intention has brought to light certain circumstances that affect the world of Eskrima. He humble and respectful like always, has agreed to answer the questions in a very correct tone, this honors him. Kurbada and Eskrido express themselves through him as they would through Manong Cacoy. So let us therefore know to a true Eskrimador. Orihinal Eskrima: Thank you very much for this new opportunity to interview you. It’s the first interview you’ve given since your Grandmaster Cacoy Cañete died. How does the lost affect you personally? How does the lost affect your training ? GM John Mac: Thank you and it is my pleasure to do this interview. The loss affected my training tremendously, I have no energy to go to the headquarters to train. OE: What do you think Eskrima world has lost since such an important icon disappeared? GMJM: It is indeed a big loss to the world of Eskrima the passing away of our mentor the late SGM Ciriaco “Cacoy Canete” since Eskrima or the FILIPINO MARTIAL ARTS is our national treasure and heritage and our late mentor had a big role in dedicating and developing and propagating the eskrima that until now it is and known worldwide. OE: For some of us, you are Cacoy’s legitimate successor. What is your position within the organization? GMJM: My current position in the Cacoy Doce Pares World Federation is «Training Director». GM John Mac during seminar in Málaga (Spain). OE: Your life has been entirely dedicated to Eskrima. You have disclaimed everything just to served in the Cacoy Doce Pares. Do you deserve the position you have now ? GMJM: I feel deserving on my position as a Training director and you can see that in the constant improvement of the students and I am very much happy with the position. OE: Now that you’re back after a hard and beraeved time, what are you going to do now? GMJM: I will start all over again since Eskrima is my passion. I will continue to develop some new ideas and techniques. OE: More than 20 years of training daily with Manong Cacoy puts you in a very privileged position. You know the style and the teacher better than anyone. How do you think he would have wanted everything to go on? GMJM: He wanted us to keep on propogating the Art of Cacoy Doce Pares and keep it strong and show the solidarity. OE: If you would have your Grandmaster Manong Cacoy in front of you right now, what would you tell him? GMJM: What would I like to tell him is thank you very much for sharing your skills and ability in Eskrima to me and thank you for always being there and treating me like one of your family. What I would preach is for him to tell me more JOKES hahahahah. OE: Imagine traveling in time. Know what you know now and find yourself in the golden age of the Eskrima. Two questions: Would you have fought Cacoy ?? What would be the other Eskrimador with which you would like to have practiced or even learning Sparring? GMJM: No I will not fight him but instead I will learn from him since by knowing that he won all of his eskrima bouts against skilled eskrimador, that’s enough warning for me not to fight him. None, I dont like to be influenzed by the styles of other eskrimadors because I would like to focus and spend more time in developing the techniques which I learned from late SGM Cacoy Canete. OE: What anecdotes you would highlight abou Cacoy?? First as a human being, then as Eskrimador. GMJM: As a human being he is a TOUGH MAN as a Eskrimador He is the Greatest Eskrimador. OE: Many people were students of SGM Cacoy or have been influenced by him. Nowadays and once he has disappeared they create their personal moves, they seek protagonism or they criticize him openly … among other things they do not give credence to the Master, what would you say to these people? GMJM: Every person is entitled to give comments whether it is bad or good. All I can say is that the Late SGM Cacoy Canete is very choosy and picky person, not everybody has got a chance to cross sticks with him even if they are following him or attending seminars for quite a long time. So not all were able to understand and learn the style. OE: Seeing the current situation of the Eskrima in the world, What do you think about the situation? GMJM: I think Eskrima will always be world class and we the members will propágate it and it will stand the test of time. OE: Cacoy created a well organized style, with a certain program, belts, certificates … I personally have always run away from this, it is a topic that we have talked about a lot. Do you think it is important that Eskrima organize itself in this way? GMJM: When I started my training at the Cacoy Doce Pares back in 1992 I learned only how to fight and a lot of controlled sparring for almost two years. During those years I didn’t experience wearign belts like White belt or yellow belt or any martial art belts. Ever since my coach asked me to teach, that was the time I begun to look for Modules and curriculum because I didn’t know where to start on my teaching. And so I think using certificates and belting program is very helpful in developing and encouraging the new generations of Eskrimadors to do well and pursue the art. And some other schools were also successful by using belts and certificates on their program. 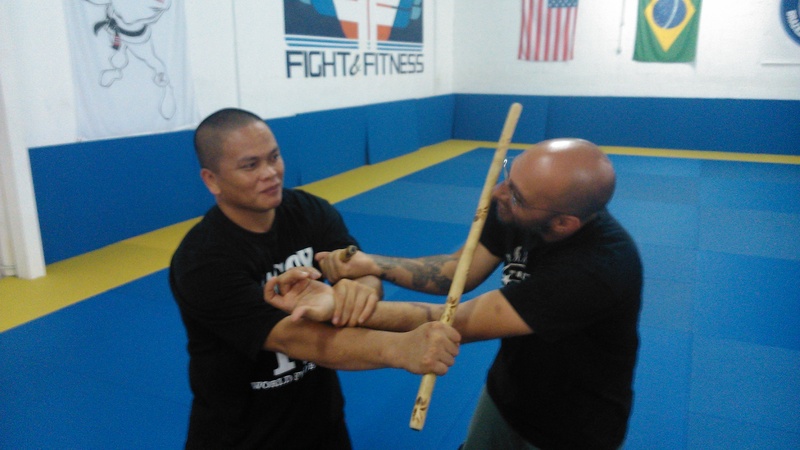 OE: Corto Kurbada and Eskrido are the personal and identifying style of Manong Cacoy into Eskrima. How do you think he came up with this idea? How would you define those styles? GMJM: Yes Corto Kurbada and Eskrido are indeed the personal and Identifying style of Manong Cacoy in Eskrima, He came up with this idea because he saw it was different from other rival groups and since he was the one who had the commitment to defend and protect the reputation of Doce Pares from the challenges that came his way he thought the style Works againts the other rival eskrima group. Plus he was always looking for better ideas and techniques to improve his style and the corto Kurbada or curving strikes was one of the best techniques he ever discovered since it was really difficult to block or defend the strikes in close range. 1948 he begun to develop the techniques which he called Eskrido after he put down to the ground one of his opponent by applying a foot sweep. Since then he got fascinated in developing more throwing and takedown techniques. OE: Now I want to change the course of the interview and ask you some more direct questions about your personal vision of the Eskrima. Expecting the unexpected makes a lot of sense doing sparring with you. How would you define your personal style of Eskrima? GMJM: The objectives is to be as good as my mentor and I know that it is still a long way to go but I am already enjoying the skills that I have today. I defined my personal style of eskrima as not great or the best but 2 steps ahead of the other best eskrimadors . OE: You know that many people say that Eskrima is not good for self-defense because you do not always go with a stick down the street (which obviously means they have not understood at all what Eskrima is)… what do you have to say about it? GMJM: In Eskrima we not only study using the sticks but we also study empty hand which is called PANGAMOT it deals against weapons like knife, Bolo or hand to hand combat so even if we are not carrying sticks at all times we can still defend ourselves against agressors or bad elements. We can utilize also things we can find on the streets as our weapon like Ballpen,tree branch,rocks or stones,empty bottles,rolled newspaper or magazines and even shoulder bags, these are very good weapons to defend yourself using eskrima principles. OE: Many «new generation» masters play with weapons (sticks, blades, knifes…) and flaunt spectacular things but then never put them into practice. They never spar or practice combat. How do you see this “Eskrima”? GMJM: I could say that just love the art no matter what syle it is, combative or non combative martial arts.There are a lot of people who just love to learn the art and dont want to go more extreme or more violent for them. OE: Can we say that without combat there is not Eskrima??? GMJM: As I was exposed first to combative Eskrima and was trained in that way, In my opinión if there is no combat for me it is not complete Eskrima. OE: We talked about it once, but I want to influence it once more. I really belive Sport within Eskrima has deviated much from the original idea. You have competed a lot, you are many times world champion among other things. On the other hand you are the most effective Eskrimadores I ever know. Then, what does the sport contribute to your Eskrima personal vision? GMJM: In my personal visión about the contribution of the sports eskrima is that I can test my skills and techniques in full speed and power and I have something to look forward like tournaments or competitions in a way it will help me to keep on training and be motivated. But eventhough now we are fully protected with helmets and body armours and hand gloves or arm padding it doesnt mean that I will ignore all the blows that I recieved or has landed on my body, I always consider them as fatal strike or a fatal hit that I must minimize and eliminate in every round. OE: What is the place of fitness into the art of Eskrima? What other arts do you think can be practiced and which benefit and transfer to the Eskrima? GMJM: There are a lot of Eskrima Drills that could help to improve your endurance and stamina where you can use as fitness training. The Boxing footwork can help you adjust your range from long to short, the throwing techniques of Judo, the push and pull principle, the Aikido principle of following the forcé and the Ju jitsu ground fighting techniques, all these arts are very useful to improve your skills in Eskrima. OE: My kid is still very young, but I dream that he likes Eskrima (i think he is on the right way!!). You gave me very good advice because you teach children. What benefits do you think the practice of Eskrima has for them? GMJM: The kids will benefit good hand coordination and mental awareness and alertness from eskrima.They will developed focus and concentration and most of all they will gain discipline. OE: One of the phrases that have marked me the most in my journey into Eskrima is one that you told me shortly , “Eskrima is a painful process”. Can you explain us this “very practical (and painful) view of Eskrima? GMJM: Yes Eskrima is a painful process because during training it is really difficult to avoid the hits that you will recieve from your opponent. Since we are using Rattan sticks as our weapons, it can cause bruises when it comes in contact with the target and we do not wear any protective devices or helmets and body armours during our eskrima training thus the painful process. OE: What are your immediate and future projects? 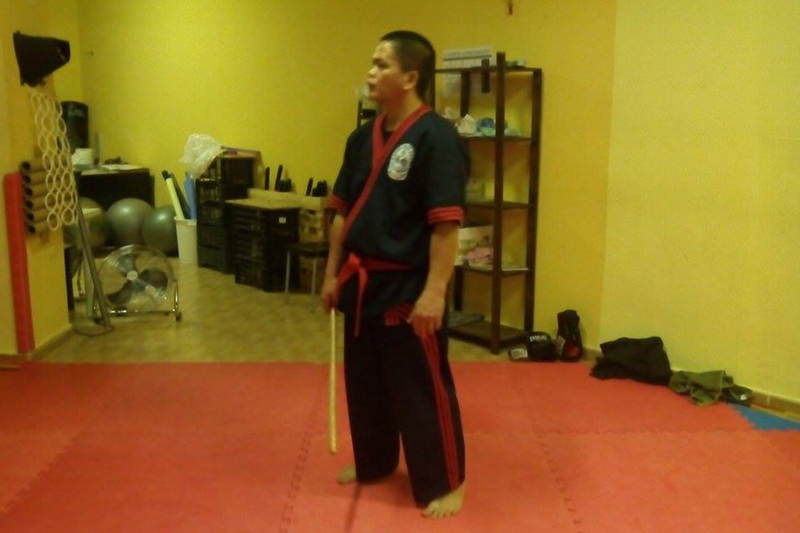 GMJM: «The only constant in Eskrima is Change» that is what the Late SGM Cacoy Canete always emphasizes. My immediate and future projects is to keep going and developing the techniques and of course to propogate the art. OE: How do you see yourself in the future? GMJM: I could see myself in the future as still a student in Eskrima because I just love to learn new ways and love to train in Eskrima. OE: When will I see you here again doing seminars and making me literally crazy in our sparring sessions? GMJM: There are plans already to conduct Eskrima Seminar for next year 2018 in Europe. OE: Finally, do you have something you would like to say to the people of Eskrima world? GMJM: What I could say to the people of Eskrima world is that just keep on practicing and continue to learn the style you think that is the best for yourself because I will also keep on practicing and will continue to learn the style that I think is the best for myself. Thanks so much for this new opportunity doing an interview. Hope to see you soon again here in Spain. We miss you here, my little Eskrimador have to learn from one of the best. A big hug from family and Orihinal Eskrima group. Link spanish version: Entrevista a GM John Mac. Previous Article← Eskrima táctica. Espada & Daga.